BRUSSELS — President Donald Trump vowed Thursday to crack down on leaks that prompted Manchester police to withhold information from the United States about the investigation into this week’s bombing. He also chastised NATO leaders for not paying their fair share to protect the long-standing alliance. A British official said Thursday that Manchester police have decided not to share further information on the investigation due to leaks blamed on U.S. officials. Trump, who said there is “no relationship we cherish more” than the one with the U.K., declared the leaks “deeply troubling” and said he was asking the Justice Department to lead an investigation into the matter. Trump issued his sharp rebuke from Brussels, a city he once called a hellhole, where he was addressing leaders at both the European Union and NATO, a pair of alliances whose necessity he has questioned. 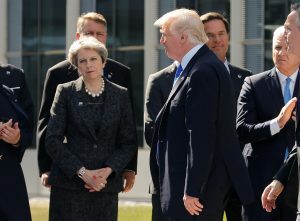 At NATO’s gleaming new headquarters, Trump returned to his longstanding call for member nations to pay their fair share, lecturing leaders about contributing more as they stood listening in awkward silence. The 28 member nations, plus soon-to-join Montenegro, will renew an old vow to move toward spending 2 percent of their gross domestic product on defense by 2024. Only five members currently meet the target: Britain, Estonia, debt-laden Greece, Poland and the United States, which spends more on defense than all the other allies combined. Moreover, though the White House had sent recent signals that the United States would stay in NATO’s mutual defense pact, known as Article 5, Trump made no mention of it as he stood next a monument dedicated to the only time the article had been previously invoked: during the terror attacks on September 11, 2001. Trump’s speech to NATO came hours after the EU council president said a discussion with him produced sharply different views on Russia. And the new French president pushed Trump on a sweeping climate agreement and even engaged in an apparent handshake stand-off. British officials are particularly angry that photos detailing evidence about the bomb used in the Manchester attack were published in The New York Times, although it’s not clear that the paper obtained the photos from U.S. officials. Trump, who unlike other leaders at the summit is not planning to address reporters, did not respond to shouted questions as to whether the UK can trust the US with sensitive material. Trump and his White House have long complained about “leakers” they think are trying to undermine his presidency. While all administrations deal with some leaks, news outlets have been privy to everything from details of draft documents to the president’s private phone conversations with foreign leaders. Recently in the news were reports that the president had shared highly classified information with Russian officials during an Oval Office meeting, revealed by those with knowledge of the conversation. Associated Press writers Jill Colvin and Catherine Lucey contributed from Washington.